As Dome 1618 begins to colonize, a sharp divide separates those who chose to live inside the dome and those that seek freedom on the outside. When the colony is attacked, Nat escapes with Evan to his home, Dome 569, a progressive dome that colonized on the outside over a decade ago. But there are many rules in Dome 569—some that come with deadly consequences if broken. Dome leader, Caroline, is not impressed that Evan failed to destroy Dome 1618 to eradicate the virus—a violation of a direct order. 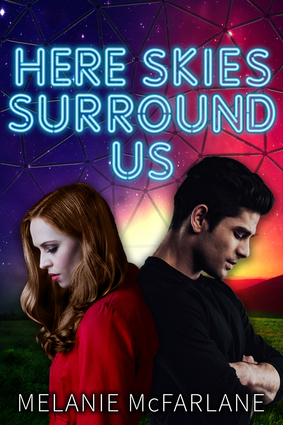 Nat uncovers secrets of Dome 569 that could tear down the world Caroline has sacrificed to protect, forcing Evan to choose between her and the only home he's ever known. Is Nat willing to sacrifice her morals and values in exchange for freedom, or will she die fighting for what she believes in? Melanie McFarlane is a passionate writer of other-worldly adventures. She is the author of Summoner Rising and There Once Were Stars. She lives in Moose Jaw, Saskatchewan.